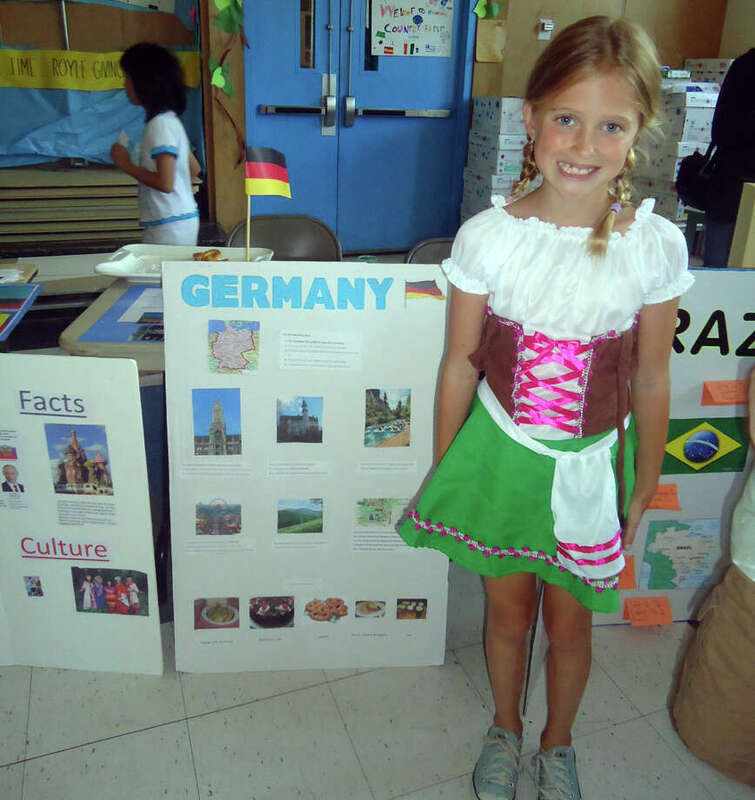 Lindsay Arrix dons a dirndl and stands in front of the poster she made about Germany at Royle School in Darien, Conn.
At Royle Elementary School's annual Country Festival, students and families "traveled" to foreign countries like Brazil, China, Italy, the Netherlands and Spain, and learned about the people, culture and pastimes of the countries. Every third-grader chose a country which they thoroughly researched for months. They made travel brochures, posters and business cards about their countries and presented them at the festival. They brought food and wore clothing that represented their countries, transforming Royle into the United Nations for the day. Visitors were treated to an array of information and food at th event. As they walked around the different displays, they tried Spanish tortillas, Irish soda bread, biscuits with Canadian bacon, and candy from Japan. They also learned important facts and fun tidbits about each country. Both the families and the students enjoyed the journey.